Meet the Brossys. As owners of Ernie's Organics, Judy and Fred Brossy were early pioneers of regenerative farming. For more than 25 years, the couple has been using organic practices to grow vegetables, beans, potatoes, and other row crops at their Shoshone farm. In 2000, realizing the need for a place where farmers and customers could meet, Judy helped organize the Ketchum farmers' market. 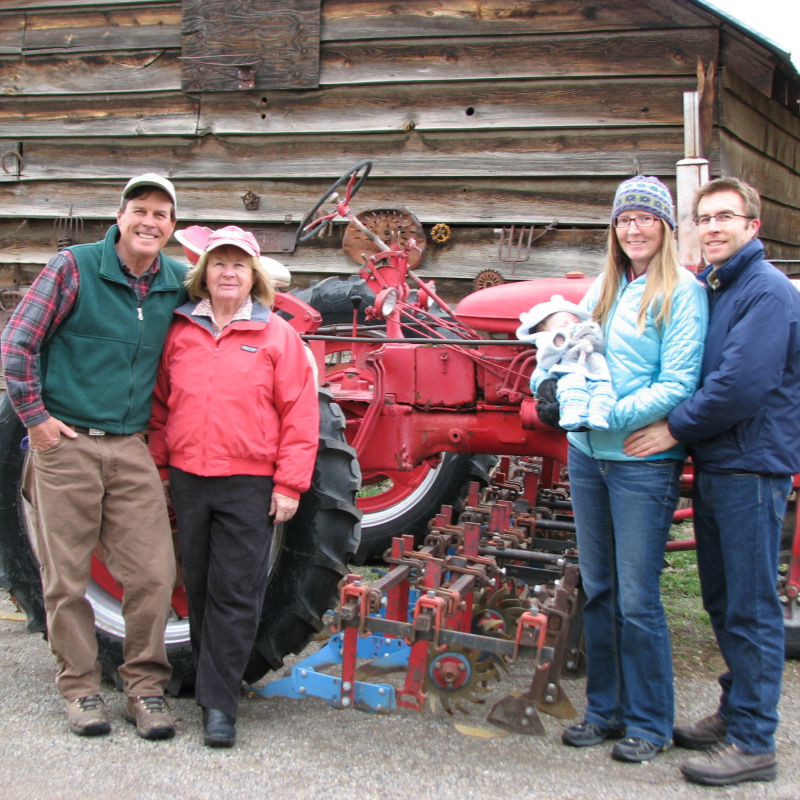 With their son, Cooper, the Brossys spent years developing healthy soil using no-till farming, cover crops and other methods. Last year, Fred earned the title of Potato Grower of the Year by the Idaho potato industry. LFA: Can you share a brief history of your family farm, Ernie’s Organics? FB: We moved to our farm in 1983 to manage it, along with several other ranches, for Ernie Bryant, who we had worked for in California in the mid -seventies right after we were first married. Initially the focus was cattle grazing as part of Mr. Bryant’s overall ranching operation. In 1996, at the urging of some organic farmer friends, notably Nate Jones and Michael Ableman, we decided to begin the shift to organic row crops, cashing in on the fertility we had built up over the years in pasture and hay. Initially, we grew organic potatoes and edible beans, which are still an important part of our crop rotation. In order to help convince the owner that this was a good program, we named the operation Ernie’s Organics, and put his picture on the label. Our organic efforts were successful enough, that in 2003, when Mr. Bryant announced his intentions to sell his Idaho ranches, we decided to try and purchase the farm, which we were able to do in 2005. In 2016, Cooper and Ahnna and their daughters Fiona and Tamzen moved back to help with the farm, which has been a wonderful addition to the operation. LFA: What do you find most rewarding about farming? FB: The challenge. Farming the way we do requires new learning on a daily basis, which is what makes it interesting. Planting seeds, watching them grow, cultivating the crops, and reaping the rewards at harvest time, all the while immersed in a beautiful landscape, is incredibly rewarding, and keeps us coming back to do it again, year after year. LFA: What is produced on your family farm? FB: Currently we grow edible beans, potatoes, wheat, alfalfa hay, corn, garden bean and other vegetable seed, as well as many different cover crops. LFA: What regenerative farming practices do you use at Ernie’s Organic? FB: Regenerating crop and range lands is imperative to the future for our grandchildren and our planet. Adding back the carbon to our soils which tillage has released and eroded through-out our agricultural history is really the only way to reverse climate change. To this end, we are making a concerted effort to do that on our farm by keeping the fields covered with growing plants year-round, and minimizing soil disturbance. We have had a multi-crop rotation from the beginning, which included cover crops. More recently, along with reducing tillage, we are incorporating no-till planting where we can. Because we do not use herbicides, this is quite challenging. We are also adding more cover crops to our cropping program, and plan to reintroduce livestock grazing to the crop ground, which we had discontinued about 15 years ago. This is all in an effort to make the farm better and more resilient every year by increasing soil organic matter content, ultimately being able to raise more nutrient-dense crops with less water. LFA: What role did your family play in the start of the Ketchum farmers’ market? FB: In 2000, Judy, along with several other local growers, was instrumental in starting the Ketchum Farmers’ Market, across the street from Atikinson’s Market. The timing was good, and it was successful from the start, thanks in large part to Chip and Whit Atkinson who provided the space for the market. Judy and Fred co-managed the market for the first few years before a manager was hired. LFA: What has the family done to ensure your property remains farmland for future generations? FB: Purchasing our farm was a real stretch for us, and in order to be able afford to buy it, we worked with the Natural Resources Conservation Service and the Wood River Land Trust to put a conservation easement on it, which not only ensures that it will always remain a farm, but by taking the development rights away lowered the price we had to pay for it, allowing us to swing the deal. LFA: Name one food that you really wish you could grow. FB: Stone fruit. We farm in a real icebox and more often than not, our heirloom apricots get frozen during spring bloom. Being able to reliably produce apricots, peaches, and plums would be a real treat. LFA: How can our community best support you and other regional farmers/ranchers? FB: Buy organic food from local producers and talk with the producers about their operations. Have a conversation with them about how the food is grown and what it takes to provide local food, including the true costs of production. While big organic and store brands have increased access to organic food, they have also created a race to the bottom in terms of transparency, food quality, fair compensation to the farmer, and carbon footprint. LFA: Who is your food hero? FB: We have so many food heroes. First among them are Nate Jones and Mike Heath, both of whom have shown so many of us that local, organic food is possible. They have encouraged us when times are tough and helped us celebrate the successes we’ve somehow managed to stumble upon. LFA: What’s your family’s favorite meal made with local ingredients? FB: A King’s Crown burger matched with Judy’s (German Style) hot red potato salad and tender-crisp filet beans is always a winner. LFA: What’s your end goal or what impact do you hope to have in terms of food? FB: Ultimately, increased access to wholesome, local food for school lunch programs and for those in the community who live paycheck to paycheck would go a long way to improving the health of our communities. We need to trade some of the empty calories our kids and the most economically vulnerable eat on a daily basis for real food. LFA: What food system change would you most like to see in the Wood River Valley region? FB: A more equitable distribution of the food bounty of southern Idaho across all sectors of the population. Fresh, wholesome food shouldn’t just be available to those with high incomes.